IT Lure: Love Trains? Play OpenBVE! One extremely boring day, I was frantically looking for something to entertain me, at least for a little while, so I did the obvious thing: I opened up Ubuntu's Add/Remove application and started looking through all the software available for installation. As I reached the "Games" category I suddenly realized that it's been a while since I checked on what's new in there, mostly because I knew that, apart from a few "big" titles, the list was populated by casual, simple, uninteresting games; yep, gaming on Linux is still lagging behind. Anyway... I was scrolling down the list, almost ready to give up when a name popped out of the "crowd": OpenBVE. As this alone couldn't really spark any real interest, the one-line description put quite a big smile on my face: "Train/railway simulator compatible with 'BVE Trainsim' routes". No, I'm not a train geek, I don't own thousands of dollars worth of miniature trains and tracks and I don't need an extra room for storing my carriages collection. Moreover, I know almost nothing about how a train really works, but hey, you don't need all that to like trains. If you're a Windows users, you have quite a few titles to choose from, Trainz and Microsoft Train Simulator being the most popular. But on Linux, this is the first time I hear about this type of game, so I was definitely very anxious to try it out. 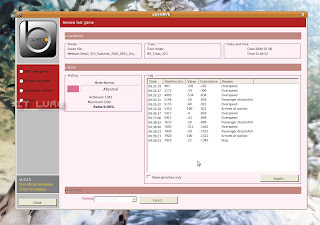 Checked the box, clicked apply and in a few moments, OpenBVE 1.0.2.0 appeared in the Games category. When I opened it, a window popped up, letting me set what needed to be set before starting the game. As I am aware that simulations can have a really steep learning curve, I went to the "Customize controls" tab to familiarize myself a bit with the way this game is controlled. Seeing how almost every key on the keyboard was being used for something, I was this close to shutting it down and starting a game of Mahjongg. Fortunately, upon taking a closer look, you will realize that you'll need only a few to simply start the train. OpenBVE has three difficulty levels: Arcade, Normal and Expert. The second is the default one, so I sticked with it. As it turned out, depending on this level, the game will either take you by the hand and guide you through the stations or will let you figure out everything by yourself. The "Options" tab in the configuration window allows you to change the language, manually set resolutions for both window and fullscreen modes, modify some quality settings like anisotropic filtering or viewing distance, and enable or disable certain elements that add to the realism of the game: collisions, derailments or topplings. Moving on, the next step was to select a track and get going already! Unfortunately, you will be a bit disappointed by the fact that there is only one route available in the default installation. But, for the sake of diversity, you'll be able to choose whether you want sun, clouds, rain, day, night, etc. Also there are three levels of detail: low, medium and high. Speaking of the graphics, you shouldn't expect too much, especially given the fact that this project is completely free and open source. Still, most of you will find the 3D game detailed enough to be a pleasure to spend hours sliding through the beautiful countryside. After you've selected the desired route, a whole bunch of details about it will appear on the right side: a short description, the map with all its stops and the gradient profile. Besides a route, you will also need a train (no kidding!). While the game will suggest one to best suit the track, there is really only one choice "out of the box". Once that's all done with, click start and, in a few moments, you will hear the serene nature sounds and find your train sitting quietly in a station, ready to leave once all the passengers board; the imaginary passengers that is - they have no graphical representation, but I assume you don't stop and open the doors just to let fresh air get inside the train. As you would expect from a simulation, your goals are pretty straight-forward: arrive in time (not later, but also not earlier), try to stay within the speed limits and don't cause discomfort to your passengers. The train has four speeds: P1, P2, P3 and P4 and three brake levels: B1, B2 and B3. There is, of course, the neutral position and an emergency brake that will bring your train to a halt in the shortest amount of time. Press F and your train will go forward, press B and your train will go back. With Q you go up a notch, with Z, down a notch. As I found out just when I was approaching the next station, a train needs a LOT of time to stop. Unsurprisingly, my first run was disastrous, with me failing to stop at the platform almost every time and having to back up. How do you know where exactly to stop? Well, when you get closer to a station, a vertical bar will appear at your right and as you approach the stopping area, a line will and gradually go down towards the center of that bar; the closest to the center you stop, the better. Once the train's stopped, the doors will open and you will have to wait for the passengers to enter. In the normal mode, this is done automatically, but if you're playing on Expert you will have to take care of all the little things. Another help you get from the game is the fact that a speed warning will appear on the screen, telling you to slow down and showing the speed limit as well as your current speed. On "Expert", only the "real" track signs will offer information about the active limits. Though undoubtedly fun, going full speed through tight turns will eventually lead to your train derailing (still fun, I know). 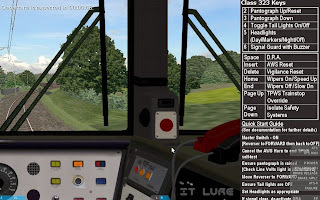 You can play OpenBVE either from the default, cab view which can be panned around with the arrow keys, or choose an exterior camera - train or track mounted. Once you arrive at the last station, you can quit the game and see how well you performed through a panel that logs every little mistake that you've done. If you're tired of Alien Arena or Sauerbraten, OpenBVE is a breath of fresh air and can provide hours of relaxing gameplay, regardless of your "train knowledge". Though the default package offers only one track and one train, new content can be downloaded from the Internet. Either way, you should definitely try this one out. You're not a Linux user, you say? 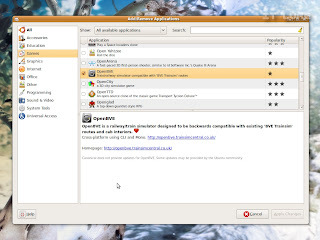 It's ok, OpenBVE can also be installed and run on Windows platforms too! As this project is still under heavy development (there are a few bugs here and there), I expect many, many improvements to be added to this great looking, beautifully sounding, accurate train simulation. 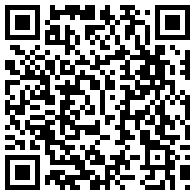 For downloads and more information, visit the OpenBVE homepage.